When Things Get Really Busy! There have been times during my career when, in a good way, demands on me as a musician really seemed to go over the top! If you’re just starting out, or even have a fair amount of professional experience, you will certainly find it challenging once things really get crazily busy for you. It is certainly a great feeling to start to be in demand and to get the work we so deserve to be getting, but it can be overwhelming if one does not feel ready for this onslaught! I was only 24 years old when all the demands on me professionally really started to overwhelm me and my emotions. The problem lies in the fact that when you are very young, and you start to get popular and in demand, our youth tricks us into thinking we can be able to handle literally everything. Truth is, it can be the total opposite, and you can be very much harmed by over-doing it! I can recall the types of recording sessions where for nearly 12 hours these artists and producers would be hammering at me, always trying to get out of me what I was not! It feels so crazy when they hear you live, being yourself, and being wildly improvisational, and when you get to the studio, they keep trying to make you fit into their picture of what a guitar player is! Yes, you may be getting a lot of work, but it could be counter-productive at times. I worked with so many artists who tried to pigeon-hole me endlessly, while I also worked with many who allowed me much freedom and expression. Of course, the latter had a great and terrific effect on me, and really helped me develop a strong sense of “self” as I moved forward in my career. So, there really is no other feeling like when you’ve finally “arrived”, but remember it can always be a mixed bag of blessings. Even these days, I find that I am literally overwhelmed by not only doing a tremendous amount of work on my own behalf, but also the great demands of making sure my daughter Lexie’s music is properly handled and produced. She just got a song in a film, has a new album, sang on the new Les Paul Tribute album, and finished school and worked late nights as a chef, all at the same time! I want to be sure the lessons I learned from over-doing it in my younger years can help her right now, in her younger years.I worry tremendously when I see how much she is accomplishing and how much she has to schedule into her life! One can be so busy, that you can be blinded by it, and it can no longer feel successful to you! Remember that you must be sure to reap the rewards of your labor, as opposed to feeling weighed down by them! Keep the good times at the top of the list, and try to let the bad ones fall by the wayside……regardless of how your career will end up, both will always be there in your memory, and all your professional experiences, good or bad, will eventually add up to a greater understanding of what it all means to you! Best of luck! I have been teaching slide guitar pretty much as long as I’ve been teaching any other form of guitar too, and I actually wrote my first book, “Slide Guitar” for Oak Publications (Music Sales) way back in 1973, when I was still just twenty years old! When you’re a “natural” at a certain technique such as slide, as I was at that age, and it comes time to teach it, or write about it, you realize just how much of it you know instinctually, as opposed to really being able to clearly “break it down” and explain it. Of course, this had to happen for me rather quickly, as I was writing a book on it, and people had never seen a guy who taught slide before, so students were numbering in the many, and I had to analyze very quickly! It’s funny, because now, these days, I relish the thought of teaching something as direct as slide guitar, because I know how to get to all the critical elements of this technique right away, and regardless of the level of the student, whatever I show them will always be applicable towards making them better, and will certainly shed some new light on the subject. Having to “break it down” is actually helped by the teaching process itself, as you become literally forced to take a good, hard look at just what it is you do to make these sounds come out of the guitar! Very subtle things develop as your teaching becomes more in-depth, such as understanding the dampening, or muting process, as well as how the left hand mutes by a finger learning to have “two sensations”. This means for example, that the index finger of say, an A power chord is not only sensing the note it is pressing down on the 2nd fret of the D string, but that it is also lightly stopping the G or even the B strings adjacent to it. These are very, very minute and subtle aspects of guitar playing and teaching, but they truly, in my eyes, constitute the very things that make playing and teaching “musical” as opposed to being just a bunch of exercises and scales to practice! After all, you really want to know how the great sounds, techniques and tones are achieved, and just exactly what goes into making these wonderful things happen, just like the pros. And believe me, I know firsthand, from having many of the pros teach for me on Hot Licks, it’s a very hard thing for many of them to actually know, analyze, and especially teach! So when you see me teaching those really tiny subtleties that make a big difference, don’t forget how much thought and analysis went into it! As I mentioned in my latest Basics Blog and also in my last regular Blog, I was about to do a great gig at NYC’s Iridium Club. This was mainly a “jam” with folks like Jimmy Vivino, Johnny A., Gene Cornish and also the wonderful Lou Pallo, along with Les Paul’s Trio. It was a true example of “making it work”, as all these musicians, many of them “wailing” all at once, managed to, in a very professional way, really turn it into an evening of fine music, full of dynamics and musical intensity. Also, above all, it was full of good spirits, friendship and great vibes, as we all realized that the sum total, or “whole” was what it was really all about, as opposed to individual performances. It was wonderful how, with all that experience onstage, we could summon up so easily all of our musical abilities to make it all work together so smoothly. I really believe, as a result of these kinds of evenings, that it is often better to not rehearse at all, and far better to call upon the well-honed musical “instincts” we all can really allow to shine in these very improvised moments. After all, the only way you’re going to really show what you’re really “got” is when you can improvise, and that’s exactly what we did, all night long! Nobody knew what songs were going to be called out, only the keys, about one second before launching into the songs themselves! This would be a great exercise for you to do with your bands, and your “sitting in” in other non-band situations. That ability to “think on your feet” is a key element to your musical success, and it’s what I’ve had to do from day one of my “real” career! Many times, I’d be onstage with an artist, and would be able to just “wing it” when it came to learning the songs right in front of the crowd! It’s the same skill one must develop as a studio musician as well…the ability to “hear it, and play it”, and to do it with feeling, skill and most of all creativity! So, give it a try….there’s nothing to lose, and you will end up developing your ear and your experience will keep on building and building till you reach that incredible moment when you know you are at “one” with your instrument! It happened over and over for us all the other night at The Iridium, and it was a true reminder of what it’s all about to be a “real” guitar player! It’s really a plain fact that a lot of the companies these days are really making an effort to recapture what they had done in their manufacturing days gone by. So much of the “vintage” boom has been based on the fact that “they just don’t make them like that anymore”, and it was true for quite some time. There are still vintage finds to be had, sometimes even at reasonable prices, but not like the old days, for sure! Much of the true vintage guitars have priced themselves out of most people’s reach, but have no fear, the new guitars are really getting great! I am not here to do any “plugging”, but I have to say that I am extremely pleased with the new Gibson that are being made. If you watch my Gibson.com lessons, you’ll see that I use a myriad of new Gibson guitars, and I can definitely attest to the fact that they were all totally consistent in quality and manufacture, and were a joy and actually inspiring to play! I know you’re at the stage of looking for guitars (what guitar player isn’t?!) and you have to make many decisions based on budget. All the manufacturers these days who offer some good, low-priced instruments are making a good effort to offer instruments that can fit into a working person’s budget. It’s incredible how some guitars that just a short time ago were $500 are now $5000, and on and on, but I believe that a lot of the current guitars being made are the “collectibles” of the future. Get yourself some good affordable guitar, and if it plays right and sounds right, you’ll be amazed at how attached you’ll become to it….regardless of price! Many times, its “perceived value” that can fool people; they may think a guitar is better just because it costs more, when in actuality a very inexpensive instrument may really do the trick. So, you simply must keep on looking, and also choose from the great assortment of new instruments that are available these days. 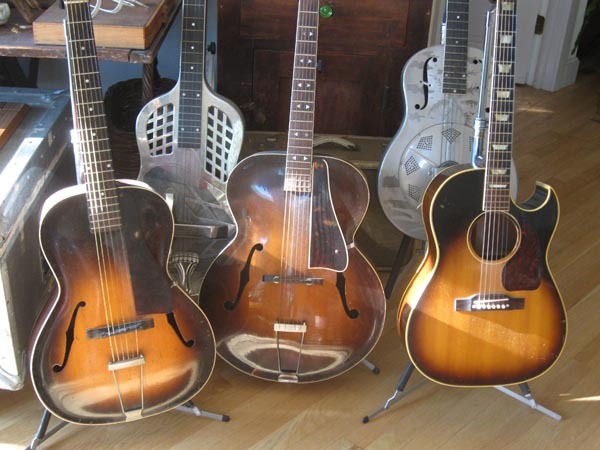 For sure, you will find not only one, but a multiplicity of great new as well as vintage instruments that will “fill the bill!” Happy guitar hunting….the thrill of the search is half the excitement, believe me! Another Great Night at the Iridium! Well, it was a packed house on Saturday night at the famed Iridium, in NYC, the place Les Paul called home on Monday nights for a long, long time! I tried to prepare myself for the performances which for me meant I was playing with The Les Paul Trio, as well as following that with a show with Rusty Paul (Les’ son) and Jimmy Vivino, Johnny A. and Gene Cornish of The Rascals! Needless to say, this was a total guitar onslaught, but as a testament to the true professionalism of all who played, we really did give each other the kind of space we needed. It was something the likes of which I really hadn’t done for quite a while since I played at all those huge Danny Gatton Tribute concerts, some of which had as many as twelve guitarists onstage at the same time! This time, it was often 5 players, and everyone good, and everyone loud! Still I was great because we all have our own distinct styles, and all being true pros, we knew how to stay out of each other’s way! There were all kinds of fun things going on all the time, and Johnny A. and I occupied one side of the stage, while Jimmy Vivino and Gene Cornish occupied the other. Johnny and I would come up with nice little harmony parts together, and there were all kinds of “in jokes” going on with me and Jimmy Vivino featuring many hysterical licks! When it was time for my spotlight and for me to do some songs, I felt that there had been far too many wailing blues tunes following one after another, so I tried to change things up a bit, such as playing and singing “Treat Her Right”, and doing a quieter version of “Ain’t No Sunshine.” This also helped shift the mood, because it was a lot slower than what everyone had been playing to that point, plus, for a change, it was a song in a minor key! For anyone who came, and there were certainly a lot of guitar fanatics in the house, it was a real pleasure, and a great lesson in how so many gifted musicians could get together and without rehearsal, really make it work! A great lesson in taste and restraint, as well as a healthy dose of when it was right to really let go! I imagine The Iridium will be posting parts of this show on their YouTube channel soon, so you should stay tuned. It was an amazing night for all! As we all know, or as you may just be discovering, guitars can be a bit finicky and can change a lot with the weather, temperatures and other conditions. It’s hard to stay on top of all situations, especially when you have as many instruments such as I have, but I’m sure that if you have an acoustic as well as a solid body electric guitar, you’ve probably noticed that the acoustic may be a bit more touchy than the electric. Many things can go wrong, and there are many signs to watch for. On an acoustic guitar, it’s very important to watch for the top starting to lift near the bridge, or even for the bridge lifting off itself. It’s actually supposed to do that before it starts lifting the top, as a safety measure! You also always must watch for any neck warpage on any kind of guitar, and this can be done simply by holding the instrument so you can look straight down the edges of the fretboard for any curvature. Most guitars have truss rods that can be cranked to help move the necks the other way, but tis must be done very carefully by a true expert, especially if the guitar is rather old. A lot of people like to keep humidifiers in their guitar cases to help keep the guitars from drying out, and some use humidifiers actually in the room itself. It’s important though, that the room be small enough so as to be able to have an effective enough humidity change when this is done. If the guitar(s) are in a large and more cavernous room, the humidity will dissipate before it can have any real effect. Also important is to keep your instruments out of the sun, as the heat will tend to dry them out too quickly, which can lead to cracking. The sad part about this is I feel that dry guitars sound much more open and airy than moist guitars. I guess the old adage that “a guitar sounds best just before it cracks” is sad but true! Another thing I have really tuned into a habit is keeping my guitars all tuned down at least a half step. This relieves the tension on the neck and on the top of the guitar, especially for the acoustics, and I many cases, I don’t bother even tuning them up to concert pitch anymore! If I do need to, I will quickly re-tune for the job, and then remember to release the tuning back down to the lower one as soon as possible! So, please always be vigilant in inspecting your guitars periodically, and when playing them so you can watch for any changes that may start to occur. Woods are very temperamental and many types are used in making guitars. These woods each have their own personalities as far as water absorption, sound consistency and other properties are concerned, and as you experience more and more guitars in your life, you’ll see what works best for you in the environment you live in! Take good care of them, and they’ll always take care of you! There’s no doubt that these days, and in days past, it has always been a great “push” for a song for it to be in a film. The popularity of that film helps carry that song along with it, and if the film really “makes it”, the music will always also be very much remembered. I, of course have had songs and music in films, most notably “Crossroads”, the blues movie with Ralph Macchio, and done lots of other more “incidental” songs in other films and TV series. My daughter, Lexie Roth has a wonderful song, “Call You My Hon” coming out in a new film entitled “Maria my Love”. This film will be featured at the TriBeCa Film Festival this coming week in NYC, and if it gets “picked up” for distribution, either in theaters or as a DVD, it will mean a great deal of success for her, as well as all the other parties involved! This kind of lucky break occurred for my daughter as the result of her meeting and befriending the director of this film. The director immediately fell in love with her music, (especially after hearing Lexie’s first album, One Long Blink) and then heard her latest stuff which had not been released yet, and was lying in a kind of “dormant” state. Well this has certainly “woken up” Lexie’s album project, and this son of hers will be truly featured in the film, and will undoubtedly focus more attention upon her musical career, and especially this new album. I always like to think that these “lucky breaks” are not really luck at all, but the result of putting in many years of hard work, and then having the music exposed to the right people. Many times, in the worlds of TV and film, the directors find themselves scurrying for musical material in an incredibly last-minute way. It’s funny, because with the incredible bounty of material out there to choose from, especially by independent artists, you’d think there would never be a problem. But that IS just the problem…there’s literally too much out there to pick from! Lexie’s song happened to just fit the scene and the mood that this Director had in mind, so she was able to immediately “plug the song into” the movie at just the right point. In fact, the scene is literally edited and based around the tune itself! You really never know where these kinds of “breaks” will actually come from, but it’s always amazed me how one good work of art or good action seems to lead to another. It’s been true for my career, and it’s definitely starting to come true for Lexie! It’s a tough world out there in the music industry, and when you blend that with film, it becomes doubly impactful, since you are now dealing in two very mass-marketed media, both with their fair share of competiveness, greed, back-stabbing and the like! Through all the ups and downs, we’ve learned to roll with the punches as best we can, and certainly to ride those “crests” whenever possible! I’m just glad to be there for her, and to see her success develop. It can only help us both, and we’re extremely excited about seeing the film with her song in it! It’s a thrill that cannot be matched! Sort of like the first time I heard myself on the radio! When I conduct my weekly Gibson “chat”, and get questions in general from students and fans, there never can be enough folks who ask me about what strings, string gauges and types of strings I recommend for various applications. The truth is, that even though I have many guitars, I try to maintain a real consistency in the strings and gauges of strings I use. Part of this may simply be laziness, but most of all, if you think about it, the size and kind of string you use is everything, and is how your guitar(s) are always coming in closest contact with you, and your emotions. If we vary the thicknesses (gauges) of our strings too often, we affect how the tips of our fingers adjust to guitar playing, and our all-important callouses are getting sent mixed messages! It’s almost as if our fingertips, which really must adjust to what we are playing, will be confused, and physically challenged! There are exceptions, of course, and when I play slide, I ideally like to use a slightly thicker string than what I usually use, but that can affect the neck or the guitar’s top adversely, and quite frankly, makes me a little fearful to raise the guitar to a higher tuning, such as open E for example! If you like to bend, as I do, I’d certainly recommend using “lights”, or .010 to .046 strings on an electric guitar. Most players start on .009s, but they soon discover that those are too light for other applications such as rhythm guitar parts, and also slide guitar. If you step up to .010s, or “tens” as they’re called, you’ll find that they will be very applicable to almost any situation you can imagine. When it comes to acoustic guitar, I basically apply the same principal. Most folks have guitars strung with medium gauge strings, which I admit are great for straight rhythm playing, but as soon as they try to play lead or even bend the little that they can on an acoustic, it becomes far too difficult! Stepping down in gauge one degree will put a lot less stress on the top of your acoustic and its neck, and would also be more adaptable to slide guitar, and its various tunings. So, I certainly hope this helps you in deciding on strings. In the end, it’s really your choice, but believe me, my choices have been well-honed, and have really been put “through the paces.” I’ve learned the hard way that the “easy” way, and most convenient way is the method you should use to choose the right strings for you! Good luck in your string adventures! Remember, they must speak for you! It's Never Too Early to Teach! When you’re developing as a player, and whether you’ve turned professional or not, it’s really never too early to start passing on, and teaching to others what you’ve learned so far. The truth is, and I can vouch for this, you actually learn at an accelerated pace when you teach! I started showing others what I knew way back when I was still living at my parent’s apartment in the Bronx, and was already developing a reputation as a player and as a teacher. I had students who’d take the subway up from Manhattan to see me, as well as many others I would travel to. At this point I was still around 19 years old, but was already in a couple of instruction books and was signed on to do my first book, Slide Guitar, for Oak Publications. This all gave me a great sense of self-confidence, and others really did want to learn from me. Of course, for me, this was a time before the internet, and before there was a great guitarist on every block! The less competition was certainly also what made people willing to travel far for the info and wisdom, but even today, they still come from far and wide to see me. But now with the advent of grater and faster communication, I can bring my knowledge to you via such methods as my Gibson.com online lessons, these Blogs, and the Hot Licks videos and DVDs I created over the years. And all of this started with the very humble beginnings of teaching myself, moving to Woodstock, gigging for several hard years and all the while, teaching wherever and whenever I could. I used to be inspired by some friends and relatives who at that time I’d visit and “pick things up” from. I did take a few formal classical guitar lessons, which greatly helped me get my act together at the early age of ten, but it was really the self-teaching and teaching others that truly made the difference for me! I am a big believer in the fact that teaching does in fact, make you learn more. After all, where does all this knowledge come from in the first place? When I was asked to do my slide guitar book at the age of 19, and as I look back on that today, I really have to ask myself, “where did my knowledge come from?” I mean, I literally had to dissect and figure out what it was that seemed to make my technique and style “click” right from the start….why and how did I dampen those strings? Why was it best to fingerpick instead of flatpick? What are the best scales and shapes to work with, and on and on? Sure, I did some research on other well-known slide greats, because I wanted to cover a wide range in the book, and that also helped me gain a greater wealth of slide guitar knowledge that has always stayed with me. So, in the long run, all of this early teaching has certainly paid off, and I have always held the art of teaching in just as high esteem as I do the art of playing. I hope you will too. It’s one very noble thing to do, and you, and the others you help, will forever be grateful! When a group of musicians, or a particular band of yours really starts to “gel” it’s an incredible, as well as rare feeling! This weekend, I was able to assemble just this kind of group of players together for the making of my new album, and it was an incredible experience! One of the major joys was the fact that I could be reunited with one of my all-time favorite drummers and old friends, Mike Braun! Michael played first with me on the Phoebe Snow tour in 1979, then did 4 of my albums in a row, from 1979 to 1990, and then moved to the west coast. He also then got a 20-year gig with Hall and Oates, which was literally keeping him busy right up till the moment I called him for this session! The amazing thing was that musically, as well as personally, it was as if no time had elapsed between our last meeting and this one, which is truly an incredible happening, and something that helped the music immensely. The bassist, someone relatively new in my fold, Eddie Denise, did a stellar job on upright as well as electric bass, and immediately “clicked” with Michael as a bass-drum combination. My rhythm guitar player, Matt Rae, who started with me 14 years ago as my student has really come along in his own right as a wonderful player, and was extremely supportive, and also “gelled’ right into the whole rhythm section. What this meant for me was that I could take many of my leads “live”, with much less overdubbing needed. This was a great thing, as I was able to simply concentrate on the music, and keep it truly spontaneous! I know music is being made these days is many less spontaneous ways, and of course, with the advent of digital recording, and things such as “Pro Tools” and the like, almost anything is possible, or can be essentially “manufactured”, but it is still the most rewarding thing to make your music in a “real” way! Now, I am overdubbing , playing leads, rhythms, lap steel, slide and many other things over tracks that sound truly inspiring to play to….no worries, no “wandering” thoughts , and most of all a real sense of self-assurance that what parts I do play will sit absolutely right in the track as I originally planned!